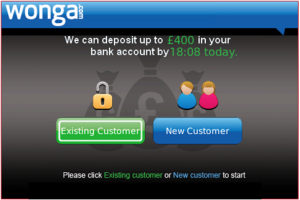 Wonga.com provides flexible cash advances from as little as one day up to a month. Our award-winning service is super fast and available online 24/7/365. Use our sliders to decide exactly how much cash you want and how many days you need it for and well show you exactly how much it will cost before you apply. Application involves completing a one-page form and youll receive an instant decision on your screen. If youre accepted, the cash will hit your bank account within minutes. Were here to help with your short term cash needs and are transparent about the cost of our service. Youll always know the exact cost of your loan before you apply. We are committed to responsible lending and we are only able to provide such a quick and convenient service thanks to our ability to assess a wide range of publicly-available data in seconds. There are no tricks or catches to worry about and if you repay a Wonga loan early youll only pay for the time you borrow, saving you money. To use this application you need to be over 18, a UK resident with a bank account and debit card, plus have a regular income. The Wonga application is free to download.